The flag of Argentina is one of the oldest and most influential flags in the Americas. However, the popular belief that the colors represent the sky and clouds prove that this flag is still very misunderstood. The roots of the Argentinian flag were formed during the Argentine War of Independence between those loyal to the Spanish monarchy (royalists) and native Argentine patriots. Before we dive into the history of the flag, we need to examine the causes of the war. In 1808, Napoleon Bonaparte turned France against its former ally, Spain, then the ruling power of Argentina. After a swift military campaign, King Ferdinand VII of Spain was overthrown by Napoleon, who in turn handed the throne to his brother, Joseph Bonaparte. Despite Spanish efforts to force the French out of the country, Joseph and the occupiers only strengthened their rule and forced the dissolution of all forms of Spanish government in February of 1810. When news of the events reached the Argentine capital of Buenos Aires in May, it sparked a week of events that came to be known as the May Revolution (very original). Because the current Argentine government was now officially under the control of France, the Argentinians felt it necessary to establish a new government that continued the rule of the true Spanish king, Ferdinand VII. 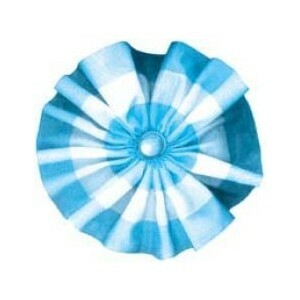 During this week, those who supported the new government wore a circular knot of ribbons, known as a cockade, in a light blue and white pattern, which were the colors of Ferdinand’s House of Bourbon. However, this new government only included delegates from Buenos Aires and other select cities within the territory, which at that time included parts of present day Chile, Paraguay, Uruguay, and Bolivia. This seclusion caused a rift between those territories, with some supporting the events of the May Revolution and others staying loyal to the new Spanish throne, eventually leading to war. Now that we have some background on the war, we can dive into the history of the flag. Manuel Belgrano, one of the principal patriot commanders loyal to the new government, noticed that the patriots and royalists (supporting the French-influenced rule) were fighting under the same Spanish colors (red and yellow). In 1812, Belgrano successfully solicited the patriot government, known as the First Triumvirate, to have the patriot troops wear the distinctive light blue and white cockade of the May Revolution. Nine days later, Belgrano created a triband flag based on the cockade and asked his troops to swear allegiance to it; however, the flag’s colors were reversed from the placement they are in today (white on the top and bottom, light blue in the middle). It turned out that swearing allegiance to this flag was premature, as the First Triumvirate did not approve use of the flag. They claimed that they were still a government ruling for the captive Ferdinand VII and that the creation of a new flag signified a desire for independence. Despite the First Triumvirate issuing orders not to use the flag, those orders would not reach Belgrano until after his troops had won battles under it and hoisted it in prominent locales. By late 1812, the First Triumvirate would be replaced by the Second Triumvirate, who had more liberal ideology. While they did not declare independence, they did permit the use of Belgrano’s flag as a war flag. The patriot forces were very successful under their new flag, which spread its popularity. When the Argentines eventually declared independence in 1816, they adopted a revised version of the flag as their national banner. The new version reversed the color scheme so that the top and bottom bands were now light blue. The flag’s most prominent feature, the Sun of May, was added in an 1818 redesign that also darkened the blue elements. The sun’s name is in reference to the May Revolution. Legend states that the sun broke through the clouds as soon as the new government was declared, which was perceived as a good omen. The design of the flag’s Sun of May comes from the first Argentine coins issued in 1813, which were also a nod to the legend. Flag of the Argentine Confederation (1850). From 1835 to 1861, Argentina was known as the Argentine Confederation and its states governed themselves without a central government. The flag went through two redesigns during this period, both featuring a red Sun of May and red Phrygian hats in the four corners of the flag, which are traditional symbols of liberty. The flag would be changed back to the traditional light blue and white flag with a golden Sun of May after a civil war reorganized the country into a republic in 1861. Flag of the United Provinces of Central America. The Argentine flag had a profound impact on the flags of Central America. French privateer Louis-Michel Aury used the flag as a model when he established the Isla de Providencia in 1818, Central America’s first independent state. Later in 1823, the flag again served as a model for the United Provinces of Central America, which included parts of present day Guatemala, Honduras, El Salvador, Nicaragua, and Costa Rica. After the UPCA’s dissolution in 1838, all of these nations continued to use colors and/or design elements from the Argentinian flag. The flag also had an influence on South American countries. Argentinian neighbor Uruguay uses the Sun of May and a similar color scheme in its flag. Also, an 1822 version of the flag of Peru was very similar to the Argentine flag, but rendered completely red.